LBJ…hated the very idea of the Freedom of Information Act; hated the thought of journalists rummaging in government closets and opening government files; hated them challenging the official view of reality. For any budding politician, FOI appears to be the ultimate political boomerang. It helps your opponents. It hinders you. To make FOI laws even less appealing, there’s no votes in them. Merlyn Rees, a Home Secretary who fought hard against an FOI law in the 1970s, once exclaimed that ‘the Guardian can go on for as long as it likes about open government…but I can tell you that in my own constituency of 75, 000 electors I would be hard pressed to find many who would be interested’. Only in India did the Right to information Act really match up with broad public enthusiasm where it was part of an anti-corruption campaign. So how is it there are now more than 100 FOI laws around the world? The question is really why would a politician support FOI in the first place? Sometimes, they often believe in openness and sometimes, leaders who don’t believe in it have openness forced upon them, as Theresa May has discovered over Brexit. Other times it’s for pure advantage, because a scandal makes it hard to avoid (as in Ireland), so a politician can ensure they get information in the future or because it’s promised FOI as part of a coalition deal (as in India). It is also about context. Often FOI laws are pushed through when there’s lots of other constitutional or legal change going on. Across the world, as Rick Snell points out, organised groups and enthusiastic individuals, often ‘outsiders’, push for the law when other key people are distracted or looking the other way. There’s also the symbolism. Promising an FOI law sends out all sorts of positive messages of radicalism, change and empowerment that new governments find difficult to resist. This is especially the case for an opposition politician coming into power, as with Tony Blair after the sleaze and secrecy of John Major. Committing to a law tells voters ‘we are different’ and also offers to give ‘the people’ a new right. FOI also carries a pleasing moral angle for politicians: ‘you can look inside as we’ve got nothing to hide (unlike the last lot) etc’. All these reasons make FOI laws, at least on paper, hard to resist. The problem for politicians is that they can overdo it. In 1996 Tony Blair gave a speech where he referred to FOI as ‘not just important in itself. It is part of bringing our politics up to date, of letting politics catch up with the aspirations of people’ and went on to say it would help involve more people in politics and increase trust in government. Blair’s words came back to haunt him, and stop him, when he wanted to water down the law. The problem is that when the enthusiasm dims FOI is then hard to back out of. Politicians often display public support but have private regrets. Once in power there are fights behind closed doors as regretful enthusiasts and those who weren’t paying attention wake up and fight back: some laws are lost or put on hold and most are watered down. Parliaments, civil society and the media try to keep proposed laws alive. Those FOI laws that survive often emerge as a compromise between the hopes of campaigners and the fears of government. Freedom of Information. Three harmless words. I look at those words as I write them, and feel like shaking my head till it drops off my shoulders. You idiot. You naive, foolish, irresponsible nincompoop. He went on to claim it was used only by journalists and mainly deployed as a ‘weapon’ (none of which is true). David Cameron, despite talking up Open Data, also felt FOI was a ‘buggeration factor’ and tried to reduce the strength of the law. Yet outside of government FOI laws are popular. The laws have been used recently to find out, for example, about the hundreds of council tax arrears notices sent to councillors, Brexit voting figures and the number of patients stranded in hospitals. It has even led to the mass resignation of a parish council. So FOI laws get here because they are hard to resist in opposition but hard to back out from in power. Even Lyndon Johnson signed the law and, as his Press Secretary pointed, went and took all the credit for it afterwards. 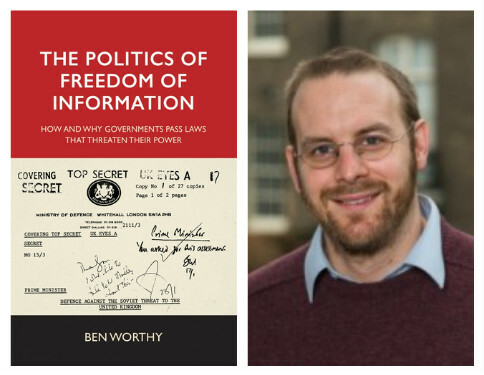 Ben Worthy is a Lecturer in Politics at Birkbeck College. His new book The Politics of Freedom of Information: How and why governments pass laws that threaten their power is published by Manchester University Press. You can read chapter 1 here.